Santa Fe, The Gerald Peters Gallery, and New York, John Van Doren, Arshile Gorky: Three Decades of Drawings, September-November 1990, no. 29. Gorky first became interested in Surrealism in the 1930s, and it became a vital resource for him again in the 1940s, when he became acquainted with migr artists Breton, Ernst, Lam, Matta and Tanguy, who were spending the war years in New York. 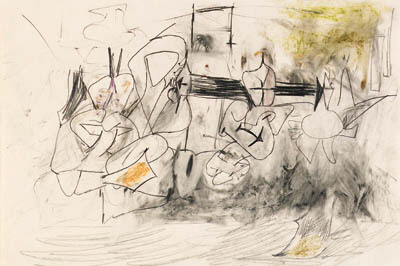 Gorky was especially drawn to the idea of automatist line, a continuous and spontaneous means of drawing by which the artist would record his subconscious ideas and impulses. "Gorky's line takes on a ductile elegance and precision not even attempted by the Surrealists. Gorky was able to work directly and spontaneously for the first time in his career. He fused all of his sources from his observation of nature, from his own past style, and from his own inner meaning at the moment of drawing or painting. For the most part, Gorky no longer reworked old themes, nor did he feel the need to endlessly restate each motif. He continued to work in series, but now the number of variations was reduced to, usually, two or three." (J.M. Jordan and R. Goldwater, The Paintings of Arshile Gorky: A Critical Catalogue, New York, 1982, p. 84). Even with greater immediacy in his draftsmanship, Gorky still followed a systematic process in the creation of his paintings. He first made line studies, and then transferred them by means of a grid to canvas, and then proceeded to paint, alter and repaint. Drawing, however, remains the prime mover in this process, and contour lines defined his forms with infinite subtlety and nuance. "Meaning is not in abstraction, but in a painstaking morphology of the visual and tactile world, depicted in a draftsmanship which draws hairline distinctions between fleshy masses, hard boney protruberances, ephemeral clusters of overlaping petals, or the fragile bodies of insects." (W.C. Seitz, Abstract Expressionist Painting in America, Cambridge, Massachussetts, 1983, p. 16).